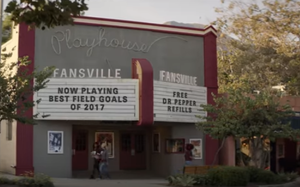 Dr Pepper's new ad campaign will unspool like a soap opera through the college football season ending with the "season finale” during the National Championship on January 7, 2019. The first spot in the campaign debuts August 27. Others will roll out during the season on ESPN, CBS and FOX. Supplemental storylines will be presented exclusively on digital and social media. To further integrate the creative concept, Fansville will also appear across digital, print, radio, OOH advertising, as well as on Dr Pepper’s social media platforms throughout the season. Last year Dr Pepper spent $112.6 million on advertising and $28.2 million during the first quarter of 2018, according to Kantar Media. The cost of this particular campaign has not been disclosed. Dr Pepper has been a longtime sponsor of college football, recently extending its official sponsorship of the College Football Playoff and Presenting Sponsorship of the National Championship Trophy through 2026.